Yoga Baby spreads his arms out like a butterfly . 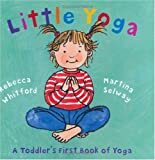 . .
Yoga Baby wobbles like a little bird . . .